Well, since I went to the trouble of playing the game and all, and I have I think a fairly decent score, here's one for Bosconian. Had a few friends over yesterday for some arcade action. Ended up doing a bit better than my 1942 score posted here. I'm still working on getting back to my million+ scores, but this'll do for now. Here's my current high score on Shaolin's Road I got a couple weeks ago on my cocktail cabinet. Haven't attempted to top it yet. Took a long time and I actually just gave up at the end of the run since it was 2:30 in the morning and my button mashing arm was sore! 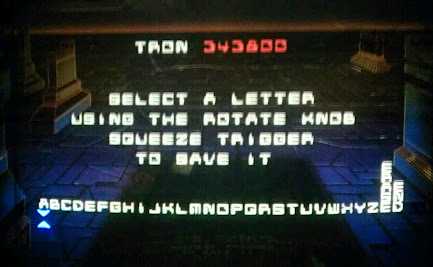 Post a screenshot of your score, you can press F12 in Mame or just take a picture and then I'll add your Discs of Tron score to the scoreboard. The image you linked is only 1 pixel. KLAX - the game that got more of my OSAP money than my actual university education. Single credit score, default settings.